As NourbeSe Philip’s Zong! – an experimental poetry cycle on the murder of Africans aboard a slave ship full of intentional gaps and interruptions – importantly gestures towards, the history of Caribbean colonialism is complicated and incomplete, its gaps haunted by a myriad of untold stories. As part of this colonial history, classical antiquity was introduced to the Caribbean through a colonial education system that privileged the stories of ancient myth over those native to or about the Caribbean. As with many of colonialism’s legacies, the classics still hold a complicated influence over the Caribbean’s cultural memoryscapes; Caribbean authors still find themselves in positions in which those drawn to classical material must also negotiate its colonial legacy at the same time as conceptualizing an original work. Amongst all this, we find accusation that all Caribbean writing is mere ‘mimicry’ of European literature, as V.S. Naipaul’s novel The Mimic Men might have us believe. In this talk I want to discuss some of the strategies Caribbean writers Walcott and Harris have utilized to negotiate this complicated legacy of classical antiquity; namely through literary self-consciousness, deconstruction, and the introduction of the concept of ‘simultaneity’. I will also at times compare their approaches with José Triana’s Medea in the Mirror, a revision of the ancient Medea myth in modern Cuba that sees its heroine possessed by the spirit of the ancient sorceress. Through discussing the strategies of these different writers and dramatists to approaching the much-contested history of the Caribbean, classical antiquity, and the legacies of European colonialism, I aim to highlight the unique and crucial impact Caribbean authors have made on the concept of ‘classical reception’, and the discussions they have shaped around the ideas of legacy and cultural heritage. 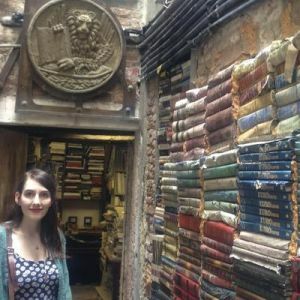 Madeleine Scherer is a PhD student at the English and Comparative Literature Department of the University of Warwick, specializing in the reception of Graeco-Roman mythology in twentieth century postcolonial literature. Her dissertation focusses on the reception of the classical underworld in Irish and Caribbean literature, comparing how the ancient trope of Hades is used by postcolonial writers to interrogate the past, and can thereby assist with reconceptualising dominant forms of memory and historical writing. She has published on classical reception, classical antiquity, and postcolonial literature, and is currently working on a co-edited collection on memory and katabasis narratives.